Have you ever come across a situation when you visit a website and an unwanted video starts playing on its own? If yes, then you must agree that auto playing videos are one of the most frustrating experiences that no one ever wants to endure. Fortunately, it turns out that there is way to shut these down right within your browser. Regardless of whether you use Google Chrome, Mozilla Firefox and Internet Explorer, you don’t need to suffer from these annoying auto-playing audio and videos clips anymore. 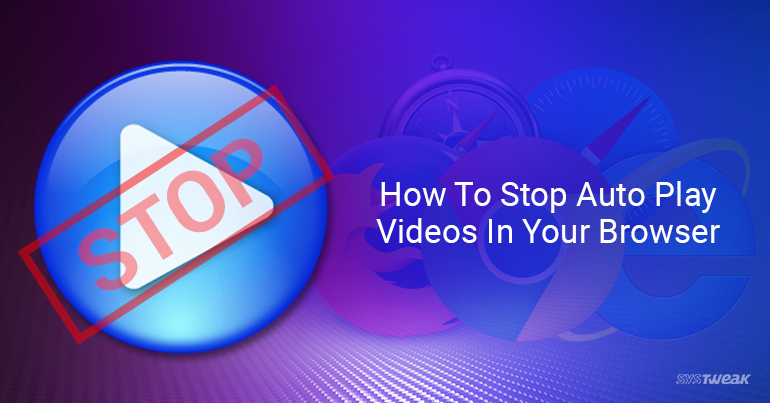 In this post, we’re going to discuss how to stop auto play in videos in Google Chrome, Mozilla Firefox and Internet Explorer. How To Stop Auto Play Videos In Google Chrome. Step 1: Login on your computer. Step 2: Open Chrome and click Menu icon from the top right-hand side corner. Step 3: Select Settings from the drop-down list. Step 4: At the bottom of the page, click the ‘Show Advanced Settings. Step 5: Select Privacy and then hit’ Content Settings’ tab. Step 6: In ‘Content Settings’ dialog box, select plugins and select ‘Let me choose when to run plugin content’. Step 7: Select ‘Done’ to save the changes. Note: Now, you will notice, instead of seeing the video ad’s playing, you will see a grayed box with a puzzle piece. Step 1: Click on the puzzle icon which has little red cross in it from right-hand side top corner of your browser. Step 2: Choose ‘Always allows plugins on http://www.nfl.com’. Note: If you want to watch videos from websites, then click “Manage Plugins Blocking” and select the all websites you want to allow. How To Stop Auto Play Videos In Mozilla Firefox. Step 1: Launch Mozilla Firefox on your computer. Step 2: Either press Ctrl-L to go to the address bar, or type in the local URL “about:addons”. Step 3: Click Plugins in the left pane. Step 4: Now, search Shockwave Flash in the list of plug-ins. Step 5: Select the drop-down menu on the right and choose ‘Ask to Activate’. Note: As, majority of these videos run on Shockwave Flash, so this fix is based on that. How To Stop Auto Play Videos In Internet Explorer. Step 1: Open your internet explorer browser and select tools from the menu bar at the top of the window. Step 2: Select ‘Manage add-ons’ from the drop-down list. Step 3: In Manage Add-ons window, select ‘Toolbars and Extensions’. Step 4: Now, look for Shockwave Flash Object and double click on it. Step 5: In the More Information window, click ‘Remove all sites’ button and close the window. Note: As, most of these videos run on Shockwave Flash, so this solution is based on ‘Shockwave Flash’ technology. Now, the video auto play feature is disabled on your Google Chrome, Mozilla Firefox and Internet Explorer. To make sure, you have performed all the steps correctly, visit any website that contains some videos and check if the trick worked.